The BCS National Championship Game is scheduled for January 7, 2008 and the New Orleans Marriott at the Convention Center has opened their doors to welcome fans and spectators to stay in luxurious accommodations for the weekend of the game. New Orleans is gearing up to host the Bowl Championship Series (BCS) game on Monday, January 7, 2008 at 8 p.m. ET this year. In association with Fox Sports and foxsports.com on MSN, Louisiana State University will play Ohio State University in a dual to the end. While both teams surprised their fans by pulling through with last minute wins, it was also due to the fact that a number of other teams were unable to take advantage of key winning opportunities, thus producing a BCS title game of LSU vs. OSU in a new year match-up. Housed in the Louisiana Superdome which seats up to 72,000, and a projected $17 million payout, the game's fans will enjoy calling the Marriott New Orleans, LA riverfront hotel home for a day or two. Featuring brand new deluxe bedding complete with down comforters, custom duvets and cotton-rich linens, flat screen TVs and plush bathrobes, each and every guest, fan or media partner will delight in the opulent elegance of this critically acclaimed hotel. Convenient to all major area attractions and sites, including the Superdome, this New Orleans hotel is home to the famous Wolfe's in the Warehouse. This New Orleans restaurant is where celebrity chef Tom Wolfe and his culinary staff prepare Creole cuisine in a creatively continental environment. After the big game, wind down at the Marriott and enjoy a delectable meal at Wolfe's before calling it a night in a remarkable guest room and suite. Turn a night at the game into a mini New Orleans getaway complete with winning accommodations and meals fit for champions. Discover a New Orleans, LA hotel that delivers a legendary experience rich with historic elements at the Marriott New Orleans Convention Center Hotel. Located in the Warehouse/Arts District, this New Orleans riverfront hotel is across the street from the Convention Center and Port of New Orleans, as well as within walking distance to the French Quarter, Harrah's Casino, and the city s finest shopping and dining establishments. Housed in a former cotton mill from the mid-1800's, this riverfront hotel in New Orleans expertly combines classic antiques with modern amenities and trendy decor. Indulge in luxurious accommodations, as well as fine dining at Wolfe's in the Warehouse featuring exceptional Creole cuisine prepared by celebrity chef Tom Wolfe. Take advantage of the fully equipped business center and 24,464 sq ft of flexible meeting space designed for corporate events. Have your expectations exceeded when you make your New Orleans hotel reservation at Marriott New Orleans Convention Center Hotel. 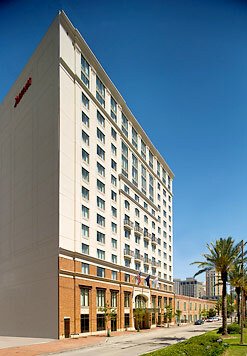 For more information or to make a reservation call 504-613-2888 or visit http://www.marriott.com/hotels/travel/msymc-new-orleans-marriott-at-the-convention-center/.